What processes are involved in the formation of individual stars and stellar clusters in our own galaxy and other galaxies? Scientists at the University of California, Berkeley, and Lawrence Livermore National Laboratory are using NASA’s most powerful supercomputer, Pleiades, to create unique star-formation simulations to answer this fundamental scientific question. 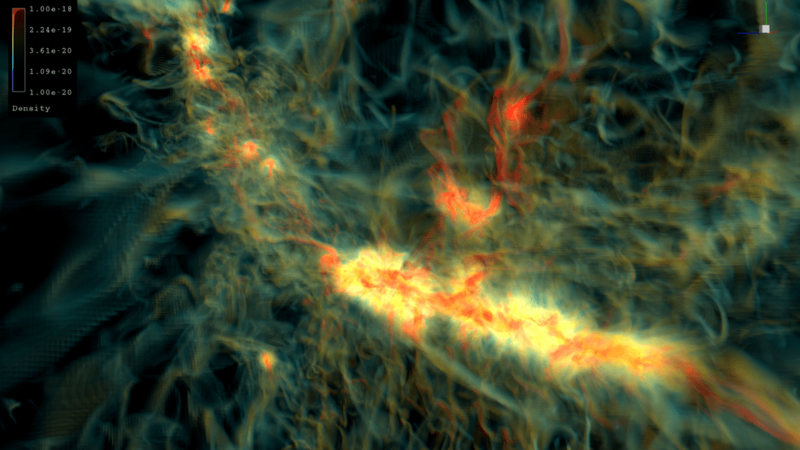 Like something from a video game, the simulations zoom through the entire evolution of young star clusters. A giant cloud of interstellar gas and dust collapses under the forces of gravity. Inside the cloud, turbulent clumps of gas form and then collapse. The collapsed clumps form star clusters, and then the magnetized, swirling cores further evolve to form individual or small groups of stars. These complex simulations as seen here — which capture a mix of radiation, magnetic fields, gravity and other physical phenomena — were produced with UC Berkeley’s code and run on the Pleiades supercomputer, located at the NASA Advanced Supercomputing (NAS) facility at NASA’s Ames Research Center in California’s Silicon Valley. Currently ranked as the seventh most powerful system in the U.S., the Pleiades supercomputer was critical for obtaining the high-resolution results that match closely with observations from the Hubble Space Telescope and other observing telescopes. Scientists demonstrated the accuracy of the code by performing many independent tests of different elements of physics modeled against real known data. The science team is enhancing the code to produce new simulations that will allow them to zoom in on the formation of stellar disks — pancake-shaped disks of gas and dust surrounding protostars that are believed to be the first stage of planet formation. Reaching this goal will require even more computing power. The NAS facility is continuously growing its supercomputing capability to support even higher resolution star-formation simulations — plus hundreds of other NASA mission projects in aeronautics, Earth and space science and exploration of planets and the universe.